Photo: La Vega Clements House, ca. 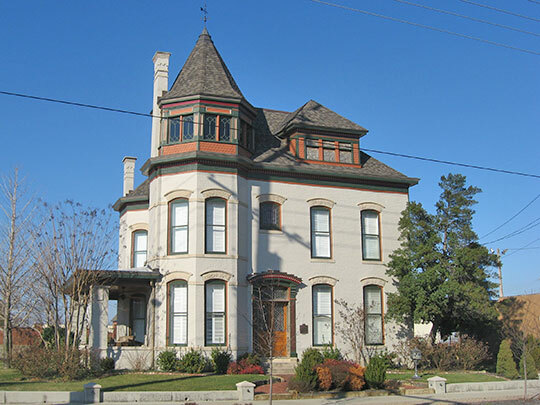 1894, 1500 North Highland Avenue, Owensboro, KY. Listed on the National Register of Historic Places in 1986. Photographed by User:Nyttend (own work), 2013, [cc0-by-1.0 (creativecommons.org/publicdomain/zero/1.0/deed.en], via Wikimedia Commons, accessed October, 2014. The Daviess County Courthouse is located at 212 St. Ann Street, Owensboro, KY 42303; phone: 270-685-8424. Daviess County (misspelled buy never corrected) was created in 1815 and named for Major Joseph Hamilton Daveiss, a U.S. Attorney and Prosecutor.